If you’ve ever admired a pumpkin that looked like Cinderella’s coach or a giant tomato that resembled a softball, learn how you can grow giant produce without chemicals. Giant vegetables are not the delicacies of the garden. Mammoth zucchinis are pithy, colossal tomatoes are watery, and 1200 pound pumpkins are hardly fit for carving a jack-o-lantern. However, no one can deny that claiming the bragging rights to a record-breaking vegetable is fun. 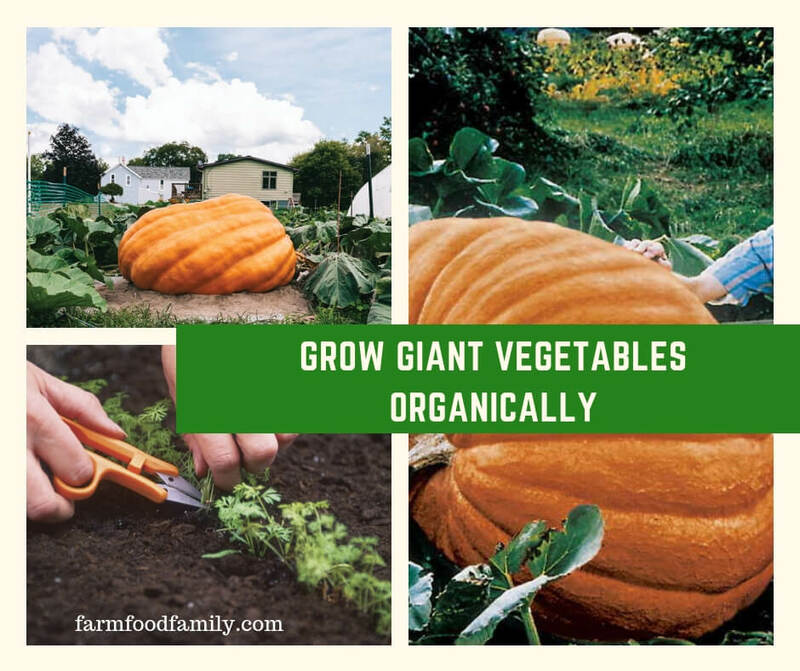 Giant vegetables capture the imagination of all ages, and you can achieve a wagon-busting harvest without using chemicals in your organic garden. Like any healthy plant in the organic garden, giant vegetables rely on excellent soil conditions to reach their hefty size. Raised beds help the soil warm up quickly, so build these in the fall to get a jumpstart on spring planting. Fill the beds with a mixture of 1/3 organic compost, 1/3 garden soil, and 1/3 peat moss. To grow a giant vegetable, start with good genes. If you save seeds from heirloom varieties, you should save only the seeds from the plants that produced the largest vegetables. Also, save seeds that are themselves plump and robust. If you buy seeds, choose those species renowned for their size. Consider ‘Dill’s Atlantic Giant’ pumpkin, ‘Delicious’ tomato, ‘Carolina Cross’ watermelon, and ‘Mammoth Zeppelin’ cucumber. If you want to grow a giant vegetable, you must ensure that the plant directs all of its energy into the most promising vegetable. Therefore, you must remove all other developing fruits and flowers from the plant or vine as they appear. Only allow the most healthy, unblemished, rapidly growing vegetable to mature. Some vegetables comprise as much as 98% of their weight as water, so you must provide a steady supply to your growing giant. However, uneven watering can cause cracking or diseases to develop. A soaker hose left on a slow trickle is the best way to irrigate your giant vegetable. You want your giant vegetables to experience steady, but not explosive growth. Start with a cover crop in the fall to help condition the soil. After you’ve planted your vegetables, water them with a half-strength application of liquid seaweed and manure tea each week. These organic fertilizers provide the entire range of trace elements, and liquid seaweed provides growth hormones. Since you will be hovering around your special garden project daily, weed control shouldn’t be a problem. You’ve kept the soil consistently moist, and created loose, fluffy soil with copious amounts of compost, so weeds are easy to hand pull. Pests are a different matter. Your garden now hosts a leviathan not found in any natural setting, and it will shine like a beacon to attract every pest from squirrels to squash bugs. Since you are focusing all of your efforts on one plant, you can fortify your defenses more vigorously than you normally would for a larger plot. Use row covers to your advantage to exclude all types of winged and crawling pests. However, these also exclude pollinators, so don’t use them until the plant has set fruit. If marauding mammals are problematic, enclose smaller veggies like tomatoes in cheesecloth. Prepare to enclose larger specimens in a chicken wire enclosure, and experiment with predator urine deterrents, like fox urine.